Lanyon High School has been running a personal development program for select senior students, known as TREK, since the beginning of 2010. ‘TREK’ stands for Trust Respect Engagement and Knowledge. TREK runs on the normal class time table of 4 hours per week and includes lessons on personal development, physical and mental well being. Since the beginning the groups have also had projects with an environmental focus. The first TREK members were instrumental in the success of Lion’s Youth Haven’s “Trees in Trouble” program for vulnerable woodland trees in horse agistments. This reignited a longstanding relationship between Lanyon High School and the SACTCG as the students expanded their environmental work to include water quality monitoring both at the Youth Haven and back at the school. 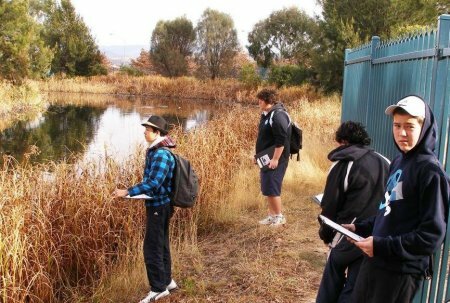 Lanyon High School is one of only a few schools to boast a residential wetland. 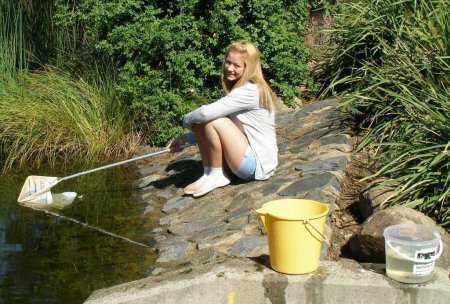 This has provided a valuable learning resource since the school opened in 1996 and has been the focus of the school's involvement in the ACT Waterwatch program for many years. Consistent and reliable data has always been problematic because of the high number of students to cater for and the ‘changing of the guard’ every semester. The TREK team have overcome these obstacles to provide monthly data on the school’s pond as well as another site in a nearby gross pollution trap, for nearly a year without a gap. The students carry out the full suit of tests as well as the biannual macros surveys. I caught up with teacher Beth McDonald and most of her TREK team during one of their regular Waterwatch lessons on a Thursday morning. With us were Brandon (Yr10), Dylan, Adam , Kyra, Gemma and Bryan (all Yr 9). I asked what had left an impression on them since starting Waterwatch. “Finding bugs, especially the blood worms” announced Gemma. “Catching the turtle” said Brandon commenting on the time an adult eastern long neck was pulled from the school pond in one of the nets during a macros survey. Oh. That wasn’t supposed to be the point of Waterwatch. I reassured them that any water drawn from the Murrumbidgee Catchment was well treated before reaching our taps but it did raise the point about the need to care for the health of our waterways. The conversation lead, as it often does with this class, to ideas for investigation. The students decided it would be good to go and visit the water treatment plant to see for themselves how our drinking water is dealt with. The health of the school pond is also another area of investigation for the TREK team. The smell that occasionally emits from the pond may be linked to the low oxygen levels they have been recording. If you are interested in finding out more about Lanyon High School’s “T.R.E.K.” team or indeed any of our Waterwatch activities please contact Martin Lind, the Waterwatch Coordinator on 6296 6400, or email waterwatch@sactcg.org.au.